What kind of financial distress? At the same time, there was a slight increase in attendance, particularly in the western part of the U.S. Many survey respondents attributed the small uptick to people “staying closer to home, and are taking advantage of parks, historic sites and museums nearby.” Other common reasons offered for the boost in attendance include new “blockbuster” exhibits and better marketing (see our post about blockbuster exhibits). Declining attendance was attributed to a general decrease in tourism, budget reductions, fewer visits by school groups, or local circumstances such as natural disasters or museum closures for renovations. See the AAM press release (PDF). 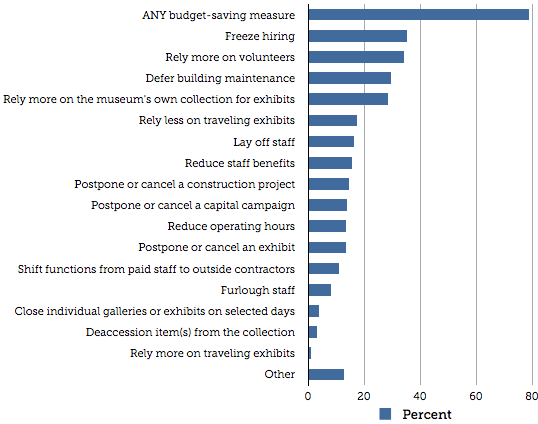 The Annual Condition of Museums in the Economy 2011 survey was conducted online between February 7 and 21, 2011. Invitations were sent to ~2,300 institutional members of the American Association of Museums, representing a cross- section of all museums in the United States, including art museums, children’s museums, history museums and sites, zoos and aquariums, science and technology museums, arboreta and gardens, etc. Responses were received from 383 institutions (17% response rate); in most cases, the survey was completed by the museum’s director, chief financial officer, or other senior administrator. 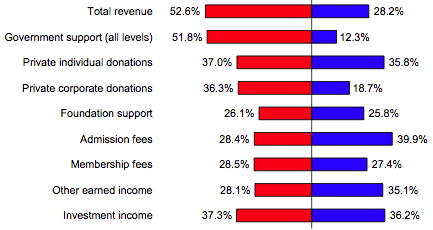 Results have a margin of error of approximately ±5% for the entire population of U.S. museums. That's interesting. Whilst we haven't directly targeted museums in the US yet, UK museums have a habit of generally wasting money. They are, unfortunately, rigged with bureaucracy – so even though you can present a cost reduction proposition, many of them are, well, just slow in availing the opportunity.